Insulating oil used in an electrical transformer is usually known as transformer oil. These oils are widely used in switch gears, florescent ballast lamps, oil-filled transformers, and various types of high voltage capacitors. Transformer oil acts as a coolant. Such oil is mainly derived from crude oil through the process of fractional distillation. In a transformer, transformer oil serves two crucial functions such as dissipation of heat which is generated inside of the transformers and suppression of arcing. Such oil exhibits excellent properties such as high resistivity, di-electricity, chemical stability, minimum power loss, and thermal conductivity. Transformer oils are stable at high temperature. Such USPs are driving the global transformer oil market. Apart from this, increasing rate of power consumption, and rapid expansion of electrical grids in developing economies are further fueling growth in the global transformer oil market. Along with this, growing demand for electrical energy worldwide is also propelling expansion in the global transformer oi market. According to experts, the global transformer oil market is anticipated to register revenue valued at US$3.26 bn by 2024 end. The growth is prophesized to occur at a promising CAGR of 5.70% during the assessment period from 2016 to 2024. Transformer oil is required for repairing and renovating the existing power sector infrastructure. The market is mainly segmented on the basis of product type, application, and region. From the perspective of product type, the global transformer oil market is segmented into silicone-based oil, mineral oil, and bio-based oil. Among these segments, mineral oil is expected to showcase fantastic expansion in the next few years, especially during the forecast period – 2016 to 2024. This is because of the mushrooming industrialization, rapid urbanization, and huge demand for mineral oil from various industries. However, apart from mineral oil, bio-based oil is the next segment to witness largest sale due to their high performance properties along with a wide range of application areas. In terms of application, the global transformer oil market is bifurcated into following segments – distribution transformers and power transformers. Among these applications, the distribution transformers segment is expected to witness highest proliferation due to the ability of distribution transformers to outnumber power transformers to a high extent. The maximum demand for transformer oil is coming from distribution transformers, thanks to the governments’ initiatives in expanding the power infrastructure in developing economies. Power transformers is expected to become the next dominating segment during the forecast period due to their significant uptake of transformer oil and broadening application areas such as circuit boards and switchgears. 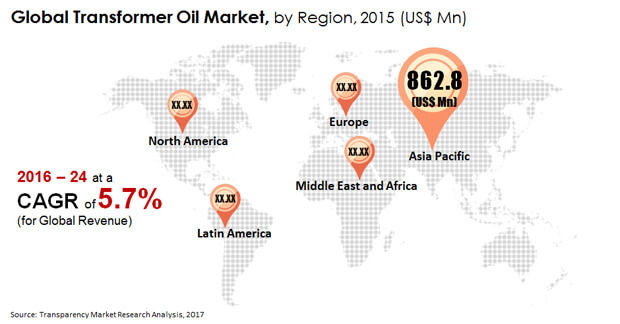 On the regional front, the global transformer oil market is segmented into Latin America, Asia Pacific, the Middle East and Africa, North America, and Europe. Among these, Asia Pacific dominated the global transformer oil market with a lion’s share of above 43%. This is because the region has seen the rapid advancement in the power infrastructure. In Europe, rapid development of offshore wind farms for power generation is driving demand for transformer oil market. Some of the prominent players operating in the global transformer oil market are Dow Corning Corp, Cargill, Gulf oil Middle East Ltd, Electrical Oil Services Ltd, and ExxonMobil Corp. These players are expanding their product portfolio to gain a competitive edge in the market.